There is quite often a misconception about compressor regulators that we will try to dispel here, as well as giving you lots of information about how to best use your compressed air regulator. While probably not all, most air compressors that have a tank will come equipped with an air regulator. It is typically located on the discharge line from the tank, upstream from the discharge coupler, which is the coupler into which you plug the connector on your air hose. Depending on the make and model of your air compressor, your compressor regulator will look something like the one in the image. Your compressor regulator may be a different color. 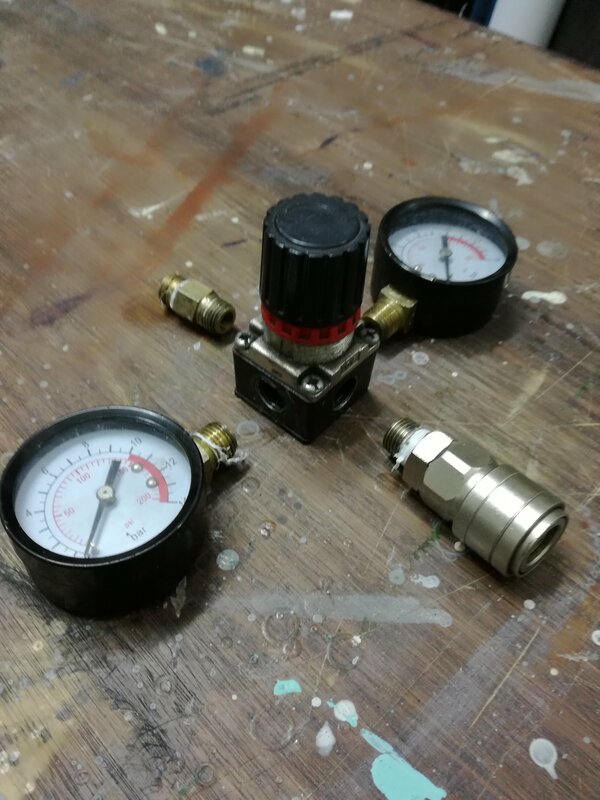 Your regulator may be bigger or smaller, it may have a smaller or larger air gauge or the air gauge may not even be directly attached to the regulator, your regulator adjustment knob may look different, yet all air regulators are basically similar in function to the one shown. Using the regulator is pretty straightforward. If you turn the regulator adjustment knob in a clockwise direction, that normally elevates the regulator pressure setting. Turn the knob counter-clockwise and the regulator setting is reduced. Whatever pressure is displayed on the regulator gauge – not the tank gauge since your compressor typically has two gauges – is the pressure of the air stream exiting the discharge coupler into your air hose. Some regulator adjustment knobs lock by either depressing them or pulling them out. If you find that you cannot turn the regulator adjustment knob, try pushing down on it or pulling it up. If it has a built-in adjustment lock, that should unlock it. The most significant misconception about compressor regulators is that they can raise the air pressure! If your tank pressure is 100 PSI for example, you can increase the discharge pressure by turning the knob in a clockwise direction. If you try to dial the pressure up past the tank pressure of 100 PSI the regulator gauge needle will stop at and display the tank pressure of 100 PSI, and that’s the pressure that will be exiting the discharge coupler to the air hose. The air regulator can only adjust pressure down. No air regulator can adjust the pressure up past whatever the pressure is in the tank or air mains. What Good Are Regulators Then? The compressed air regulator is an important device. Why? Because it allows you to dial the pressure down to the the absolute minimum required by the air tool you are trying to operate. Running your air tool at the minimum operating pressure extends the life of the air tool, reduces the amount of air used – which cuts down on energy cost to compress the air – and reduces the cycle frequency of the air compressor, which has positive ramifications for the compressor life and maintenance cycle. Always adjust the air regulator pressure setting to the minimum pressure level required to operate any of your air tools. Can You Have Multiple Air Regulators? Absolutely you can. Many industrial plants plumb their compressed air up to a ceiling mounted air main that circulates the plant. The air pressure in the air main is typically the highest pressure that the plant compressor can generate. Drop lines are installed from the air main down to the shop floor to supply compressed air to various pieces of equipment. Each machine or piece of equipment may have a different minimum operating pressure, so there will be a regulator (and typically a filter too) installed just before each piece of equipment so that the pressure can be set to the optimal performance level. So too, in your home shop you can adjust the pressure for your air line on the regulator in the discharge line from the tank, and if desired, you can install air regulators anywhere else in the line to be able to further adjust the air pressure if you have multiple uses of compressed air. For most of us DIY type folks with home or small shop air compressors, the regulator that came with the compressor will be a cheap one, mass produced in some foreign land for pennies each, and sold to the compressor assemblers for not much more than that, we expect. The diaphragm inside the regulator upon which the compressed air presses to control the downstream pressure will crack in time, through high cycle exposure, from contamination of the diaphragm by compressor oils, debris in the air stream, or drying out of the regulator diaphragm over long periods of inactivity. If the regulator diaphragm cracks, your regulator will leak all the time. The regulator gauge is cheap as well, and over time the innards corrode, or an impact might shatter the gauge-face cover. Industrial air compressor regulators typically have a good supply chain of spare parts. They are expensive enough to warrant dismantling and repairing rather than tossing them out. The typical DIY compressor air regulator does not enjoy a good supply of parts. With the price of a new regulator being in the $20 – $30 range, it’s hard to justify buying a kit (if you can find one) for almost that amount of money and spending a couple of hours tearing the regulator down and trying to get it working again. In other words, the low end regulators are basically disposable when they fail. You can replace the gauge on a regulator for around $7 – $10, however. If it’s the gauge that goes, do get a replacement. If the regulator starts to leak, sure, try to find a diaphragm for it and fix it if you can. For us, it’ll be time for a new compressor regulator at that point. Since most replacement regulators come equipped with a display gauge, if the old gauge is still working, keep it for a spare. Got a question about your air compressor regulator? Use the comment form below to ask it, and we’ll help if we can. If you see a question about air regulators here, add your comment if you can help. Only questions and comments about compressor regulators will be approved for this page. Hi folks – what happens if I install the regulator in the wrong direction? 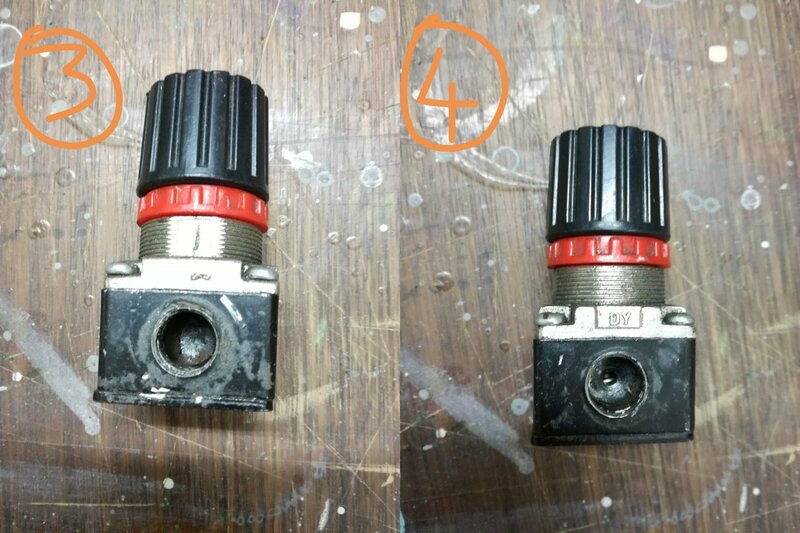 I recently took apart my regulator to reseal the component threads and realised that the regulator does not have an airflow direction marking. Can anyone tell from these photos which way I should reassemble it? Any help would be much appreciated! If you install it with the flow going in the wrong direction, you will not get regulated air pressure at the air tool, and typically the regulator gauge reading will show the tank pressure instead of the pressure you have set the regulator for. Odd regulator this one. Not seen one with a coupler, fitting and two gauges before. What is the compressor it’s off of, please? Cheers willyr! Yeah I figured replacing it might be a good option. Thanks so much for your help – very much appreciated! Where can I find a regulator #243for a lIl red air compressor model BAR233P? Jim, if the compressor is off warranty, you can put any part on it you wish with no penalty from losing that warranty. And yes, if this were my Iwata, I sure would replace the Iwata combination F/r (filter regulator) with a non-oem one for a fraction of the cost. Make sure the element is the same micron rating and the pressure range of the new setup is close to the old. Do I understand correctly that the original gauge is rated 0-15 PSI, and it received pressure above 50 PSI? I suspect, if that’s correct, that the over-pressure has damaged the gauge. No, I don’t think it’s a bad gauge, just a broken one. However, check with the gauge manufacturer to be sure. Good luck. that is my opinion also, thank you very much! I have an Ingersoll and Rand water trap regulator. It has been working well for 8 months until today. The regulator still does it job at lower psi’s, but once I try to spray at higher pressures, it shoots straight to 150psi and stays there. I don’t want to buy a new one as they run around $100, any ideas about how dire this problem is and what I could do to fix it? Hi Kurt. My guess is that you’ve got a leaking tank check valve. Perhaps you might remove it, clean the seats, and replace it and then check and see if the problem persists? Make sure you’ve dumped all the air before disassembling the fitting on the tank. Let me know how it turns out would you? I have an air compressor that I just purchased. When I decrease the air pressure the regulator leaks until the pressure of the entire tank matches the setting on the regulator. Any idea what is wrong? It sounds as though the regulator is installed backwards. By that we mean that the arrow on the regulator is pointing towards the tank, and not towards the discharge coupler. Try – with the tank empty and the power cord pulled from the socket – removing the regulator and reversing the flow. Let us know if this helps, will you? It’s working correctly. It’s just bleeding off the pressure in out going side of the line. Okay. So you say the regulator is “working correctly”? Nope, not if it’s bleeding air. Did you determine if the arrow on the regulator is pointing to the discharge coupler or towards the tank? Short of tearing down the existing regulator, trying to determine what part(s) has failed, trying to find the part(s) and then reassembling, replacing the whole regulator would be the choice as far as we’re concerned. These regulators are not expensive. 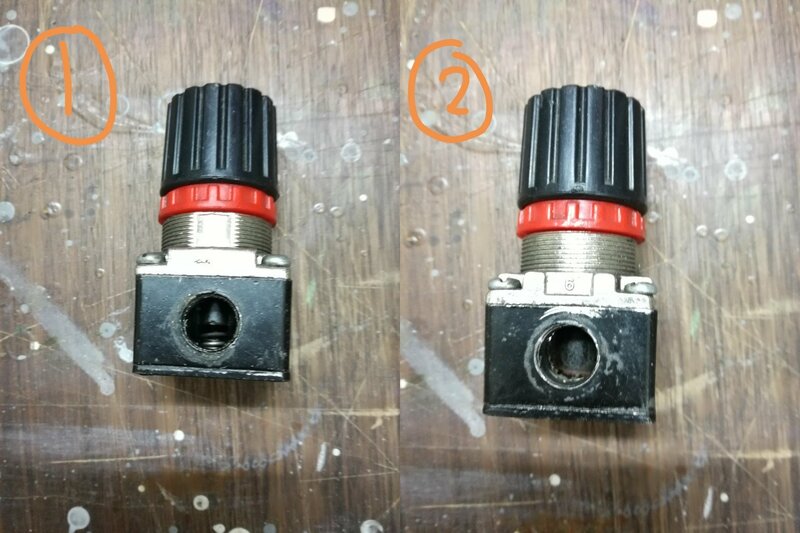 Just make sure when you install the new one that you point the arrow on the body of the regulator towards the discharge coupler – the coupler into which you plug your air line. My air regulator knob is very hard to turn. Is there a lubricant that should be used? It’s not leaking. No lubricate that we know of. If pushing or pulling on the regulator knob provides no benefit, we can only assume that some air borne debris has created a friction issue inside and it may be time to replace the regulator. Gave compressor a little cleaning. As long as the regulator has access to air from the tank, then where you plumb it is up to you. Good luck. Hi, I just installed a Kobalt 3/8 in regulator on my twin tank Central Pneumatic wheelbarrow compressor. I bought it used and when I ran it it would pop off at 150 tank pressure. This regulator continuously bleeds off pressure and won’t let me get any higher than 60 psi and tank pressure can’t build any higher than 70; did I just install a broken piece of junk? Howdy, I have an old Emglo MK5HGA-8P compressor and the regulator screw broke. It is an old enough unit that I can’t find parts anywhere for it. The regulator screws into a manifold and comes apart easily, do you know of anywhere to get parts or do you know of a screw in replacement that will go in the manifold? Hi thanks for the reply I think it makes sense. To help here is picture of the offending item. After much searching found this which is the actual part. Yes, it’s easier to acquire the exact same item. Yet you can also acquire a regulator like this, Karl, which will do the same job and you see the pressure setting on the gauge which might be easier.